Every budget-conscious couple has to make tough choices when it comes to the wedding budget. It's very difficult to splurge in every area and still come in under budget. Some couples splurge on super-tasty food, while others splurge on attire. Now that I think about it, Matt and I didn't really get to splurge on anything. It's pretty tough to plan a three-day party for 80 people with just $2,000. On second thought, I guess we did splurge on the fajita meat (which is hilarious because we're both vegetarian). We bought hormone- and antibiotic-free meat from Whole Foods, which cost way more than it would have at the average grocery store. 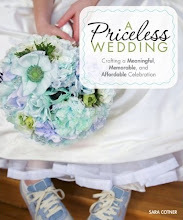 It was important for us to incorporate our values into our wedding to the extent that it was possible to embody our values and still not spend an insane amount of money for one weekend. When it came to the flowers, we really couldn't care less. In fact, those might have been our lowest priority. Don't get me wrong. I think flowers are beautiful. I think they can create a very aesthetically pleasing space and event. But with only a $2,000 budget, we had to deprioritize aesthetics. And flowers die very quickly. 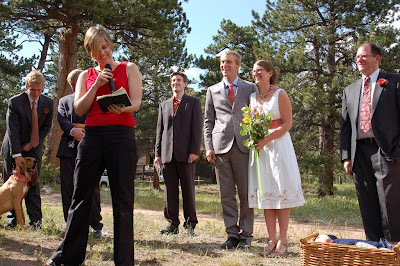 However, in our defense, we did purposefully select a naturally beautiful outdoor ceremony site (no decoration needed!) and the reception site was a B&B, so the main house was already fully decorated. We just strung white lights everywhere (which the B&B let us borrow for free!) so we could have more areas to hang out once it got dark. I did, however, insist on having a bouquet. I do a lot of public speaking, and I always have to have something in my hand to help squelch any nervousness. Usually, it's a Sharpie pen or a clipboard or a PowerPoint clicker, but I didn't think any of those options would work for a wedding. Our plan was to have our friend, Kim, pick up a bouquet from Whole Foods on her way to the Welcome Picnic on Friday night (she was already responsible for getting bread for the make-your-own-sandwiches bar). About a week before the wedding, we stopped by the Whole Foods near her house on our way to her dinner party. We took pictures of some bouquets we liked so she would have an idea of what to get. A week later, Matt and I arrived at the B&B where the reception site was held, and I noticed a beautiful bouquet in one of the rooms. I asked the innkeeper, Cathy, where she got the bouquet from. She said she had simply picked it in the woods. Since Matt and I were getting nervous about going over budget in the final days leading up to our wedding, a light bulb went off: We should call Kim and cancel the bouquet request. 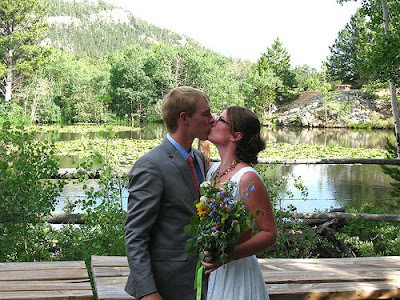 Then we should ask one of our friends to take a stroll through the woods on the day of our wedding to make the bouquet. 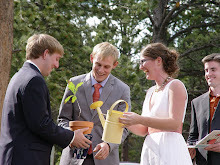 That friend was Laura, and she wrote a quest post about her experience as the makeshift florist for our wedding. She's the one in the ceremony photo above who is reading an Alice Walker poem. I’m not sure how I ended up with the bouquet-picking assignment, but I like to think that Sara made her decision based upon some high opinion of my creativity and design sense. More realistically, I think she knows me well enough to be familiar with the touch of social anxiety from which I suffer; she probably knew that an excuse to spend a few hours romping in the woods alone would be most welcome. Either way, I was excited to have the job. After wandering around the gorgeous but relatively small grounds of the Sunshine Mountain Lodge awkwardly with a big glass vase for a while, I realized I wasn’t making the most of my assignment. I ditched the vase and went trespassing into the wide-open meadows beyond the grounds, focusing more on taking in this landscape that I loved than on any imagined pressure to create the perfect bouquet. I needed to get in the zone, I suppose you could say. What difference did that make? Under pressure, all I could see were tall weedy grasses that were nothing like the roses and calla lilies that I equated, in spite of myself, with wedding bouquets. Relaxed, having stepped out of wedding mode and back into Sara and Matt mode, I saw gorgeous little wildflowers lurking in crevices and poking up above the grasses. I couldn’t tell you the names of anything I picked, but I will tell you that the colors were gorgeous: reds, yellows and purples, mostly. I picked everything I saw; it was an amateur florist’s equivalent of brainstorming. No editing, no rejecting flowers as too prickly or not pretty enough, I just gathered. I say that, but I did actually reject those past-their-prime flowers that had already dropped a few petals. Cathy, the proprietor, had offered to rob one of her arrangements for filler, but I ended up pulling a few aspen branches to serve that end. 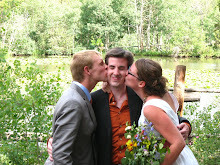 I did accept the daisy she offered from her garden, because that was the flower she had carried in her wedding: sweet. Once I had my bundle of flowers, Sara hooked me up with some wire and an assortment of ribbon and twine. I arranged the flowers in a vase first, and this is the point at which I did the editing, mostly for color. I also cut the stems a bit more than I would for a typical vase arrangement, though they were still longer than those of most bridal bouquets I’ve seen. Once I had my final arrangement, I wrapped wire around the stems, a couple of inches from the bottom, about 15 times. I wrapped twine over the wire and tied it in a bow. I thought that the unbleached twine would be more in the spirit of the unassumingly lovely bouquet (not to mention the unassuming lovely couple) more than a big purple bow. In the end, it looked like what it was: a bouquet that somebody had picked in the woods especially for Sara. It is quickly becoming a tradition in my family for the bride's closest friends to each hand her a single flower as she walks down the aisle. 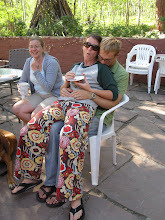 Then during the ceremony her friend/sister-in-law arrainges it. It's turned out beautifully both times and you would never guess that they were "just thrown together". Hate to be a killjoy, but I always cringe when hearing people talk about picking wildflowers - they are legally protected and, while once they covered the entire country, they are now scarce... Picking the flowers prevents them from forming seeds and cuts down on the number of new plants coming up the following year.